Home › Uncategorized › Humus Squared! Humus b’Ribua, (literally Humus squared, or Humus in a square) filed Israel trademark no. 250521 on 28 October 2012 for catering services. The mark is shown above. For those not familiar with Hebrew, the mark consists of the words Humus b’Ribua, (literally Humus squared, or Humus in a square) followed by, in smaller letters, to wipe the corners, the whole written over a square background. 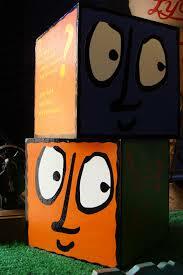 On 17 March 2013, a company called Humus b’Ribua LTD, (literally Humus squared, or Humus in a square) opposed the mark. Humus b’Ribua filed their counter-statement of case. Both sides filed evidence and a hearing was held before the Adjudicator, Ms Yaara Shoshani Caspi. The owner of the Humus B’Ribua mark, Mr Pivnik, claimed to be familiar with the legal issues and chose to handle this without legal representation. The mark Humus B’Ribua is intended to be a franchised chain of restaurants. The Opposer, Guy Yakar, owns a chain of felafel outlets, Felafel b’ribua that sells Israel fast food, including falafel and humus. The chain was set up in 1995 and sells square felafel balls cubes through 10 outlets. 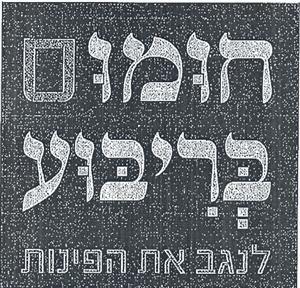 The Felafel b’ribua logo (TM 150166) is shown below. 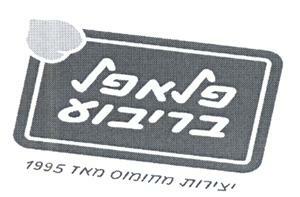 In addition to mentioning Felafel b’ribua, the mark includes the Hebrew words for “manufactured from Humus since 1995”. For those not familiar with these Middle Eastern fast foods, Humus is the Arabic and Hebrew word for chickpeas. Humus is served as a paste made from boiled and then mashed chickpeas. It is often flavoured with Tehini, which is a paste made from sesame seeds. Felafel are chickpea cutlets, balls (or apparently cubes) of course chickpea paste that may also include breadcrumbs, and are deep fried. Felafel B’ribua claimed confusingly similar marks. They claimed that they are a successful chain of fast food outlets whose main products are hummus paste and falafel, both made from hummus (chickpeas). They noted their established mark, which they asserted was in use from prior to registration in June 2001. They argued that their second mark, though filed in March 2014, was part of a branding and marketing campaign from 2011, and supported this with a write up from Idiot Achronot, invoices from a publicity agent and photos of signs and adverts. They claimed to spend hundreds of thousands of shekels a year on advertising. Felafel B’ribua further claimed that about 50% of their sales came from humus sold as humus paste (and not as falafel), however because of the confidential nature of the information, no evidence was submitted to back this claim. To support their claim of a likelihood of confusion, Felafel B’ribua produced two examples of actual customer confusion. Humus b’ribua denied the similarity. Mr Pivnik claimed to have set up his chain of humus outlets in 2011, where humus is vended in an original shape that he’s conceived. His product is humus on a square plate and he’s never intended selling square falafel or to pass himself off as Felafel b’ribua. He further claimed to have spent a lot of time and money in developing his recipe and marketing the brand. Finally, he noted changes made to the logo to differentiate toastnik b’ribua, now issued as TM 252402. The Opposition is based on Sections 11(6), 11(9) and 11(13) of the Trademark Ordinance. Claims of dilution unfair competition and of the mark being a well known mark were dropped, so the ruling depends on the whether the marks are confusingly similar or not. Section 11(9) states that identical marks for similar goods or for goods in similar classes, and for confusingly similar marks are not registerable. The logic behind Section 11(9) is to protect the registered mark owner from losing customers due to confusion, and to prevent customer confusion. The likelihood of confusion is determined by the triple test, where the first strand (sight and sound of the mark) is given more weight than the distribution channels, clientele and other considerations. The word B’ribua is identical. Whether or not the words felafel and humus, and the additional phrases concerning wiping, etc. are sufficient to distinguish between the marks requires the other tests, i..e consideration of the distribution channels, clientele and other considerations. Ms Shoshani Caspi accepts that the two foods are considered related local Middle Eastern fast food and that felafel contain humus. In addition, she was convinced that the requested mark would lead customers to consider that the two chains had a common owner with a common culinary consideration, since one sold square felafel and the other sold square plates of humus. The customer pool for the two chains is substantially identical. The terms humus and felafel are generic and descriptive and cannot therefore be used to differentiate between the two chains. The superscript 2 simply implies ‘squared’. Ms Shoshani-Caspi considered that the average consumer with an imperfect memory would be likely to be confused. The catch phrase about wiping the corners, or made from humus would not serve as branding and are swallowed up in the overall design, as are differences in font. The Felafel B’Ribua chain is well established and well publicized. Mr Pivrik apparently acknowledged that the opposer had thought up square felafel balls. Were the brand to be square falafel, it would be considered descriptive. Squared does not imply larger portions and is no laudatory. In her ruling, Ms Shoshani Caspi ruled that the marks were indeed confusingly similar and so refused to allow the Humus b’ribua mark to be registered. She further awarded costs and 5000 Shekels in legal fees to Humus B’ribua. I suspect that I am not the correct consumer to decide whether there is a likelihood of confusion as I am unlikely to be tempted by either chain, and see both foodstuffs as generic. Nevertheless, I think that marks should be considered in their totality, not analyzed as their parts. The word humus does not sound like felafel. Despite their common ingredients, the two words connote different products. I therefore don’t think that there is any likelihood of confusion. If one chain called itself Felafel Meruba (Square Felafel) and a competitor chose the name Felafel B’Ribua, there would be a case to answer for. The terms sound similar. However, felafel does not sound like humus and these words are dominant in the company names. Despite the Israel Supreme Court decision re Apropos (General Mill’s Bugles), I disagree that because Felafel Meruba (Square Felafel) is descriptive and thus can’t be trademarked since Felafel cubes are non-standard shaped. There is a chain of bagel outlets called Holy Bagel. This is a play on words reflecting the fact that the chain is centered on Jerusalem and that bagels have a hole. I think that Hole Bagels, Whole Bagel and Holey Bagel are confusingly similar. Holy Felafel, Holy Pizza are not.